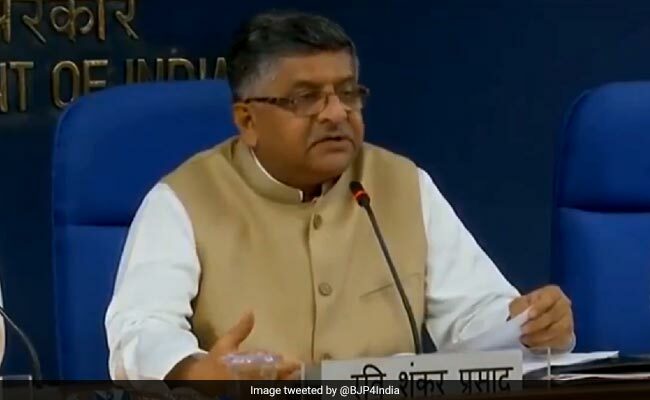 Ravi Shankar Prasad also said that the digital payment transactions in the country have increased manifold to over Rs 2,070 crore in 2017-18. Union Minister Ravi Shankar Prasad has said the government will soon make it mandatory for linking Aadhaar with driving licences. Delivering his presidential address at the ongoing 106th Indian Science Congress at Lovely Professional University here, the minister for Law, Electronics and Information Technology said, "We are soon going to bring a law which will make it mandatory to link Aadhaar with driving licence." "At presently, what happens is that the guilty person who causes an accident flees the scene and gets a duplicate licence. This helps him go scot-free. However, with the Aadhaar linkage you can change your name but you cannot change your biometrics, neither iris nor fingerprints. So the moment you go in for a duplicate licence, the system will say this person already has a driving licence and should not be given a new one," said Prasad, explaining the need for the linkage. Eulogising about the Centre's 'Digital India' programme, the minister claimed that it had bridged the urban-rural divide. Through a power presentation, Prasad said, "This is digital profile of India -- 123 crore Aadhaar cards,121 crore mobile phones, 44.6 crore smart phones, 56 crore internet users, there has been 51 per cent growth in e-commerce. There is 130 crore population in India." He also said digital payment transactions in the country have increased manifold to over Rs 2,070 crore in 2017-18. LPU Chancellor Ashok Mittal, Punjab BJP President Shwait Malik and Phagwara MLA Som Parkash were also present on the occasion.